Dodge enjoyed a great victory at this year’s Chicago Auto show. 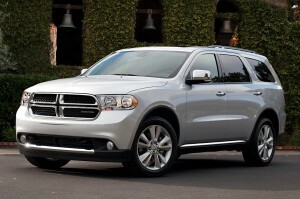 The Dodge Durango was awarded the “Driver’s Choice, Best Large Utility” by the editors of MotorWeek. The magazine has judged the best cars and trucks for the year for over 31 years. The Drivers’ Choice Awards is an annual look at the vehicles from the point of view of the prospective buyer. The process reviews priorities such as value and reliability, and also takes into account the latest trends and innovations into the consideration. Add this to the list of great news coming Dodge’s way. With the recent display and hype building for the Dodge Dart, the numerous awards given to the different vehicles, and seeing a 29 percent sales increase in January makes it a phenomenal start to the year. Dodge is surely in for one of their best years ever. See all of Dodge’s available vehicles online at Bayside. Be sure to also follow on Facebook as well as Twitter and you can see all the latest deals and offers. This entry was posted in Bayside Queens, Dodge Durango, Dodge News and tagged 2012 Chicgo Auto Show, Bayside Queens, Best Large Utility, Dodge, Dodge Durango, Drivers' Choice, Facebook, MotorWeek by baysideadmin. Bookmark the permalink.